Figure 1. 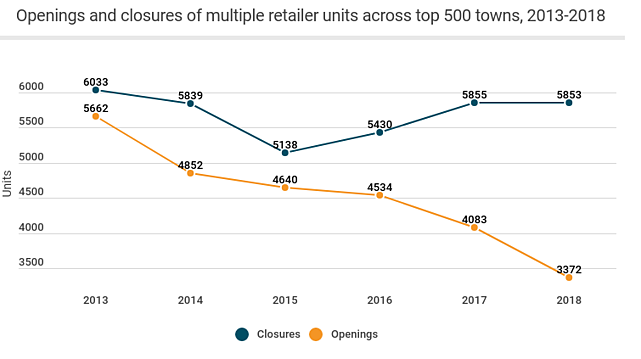 Openings and closures of multiple retailer units, 2013-2018 (Source: Local Data Company). Table 1. 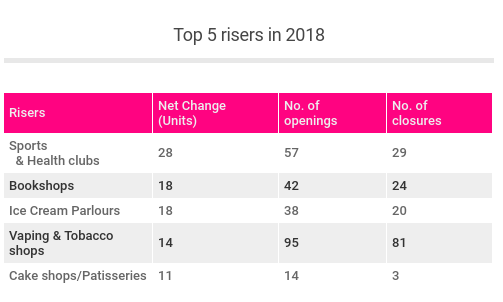 Top 5 net risers in 2018 (Source: Local Data Company). Table 2. 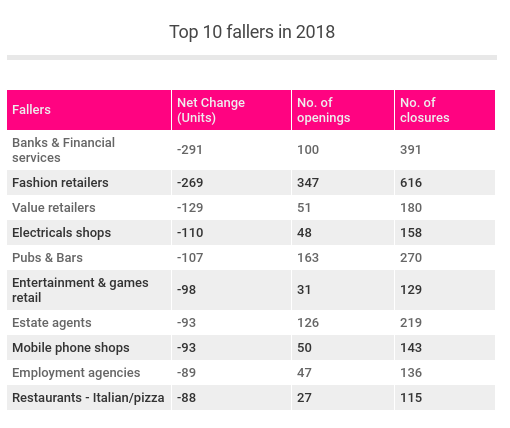 Top 10 net fallers by business type in 2018 (Source: Local Data Company). Looking at the first quarter of 2019, Local Data Company data finds that closure rates remain high as 1,358 outlets alongside 849 openings. This is a direct consequence of CVAs, store downsizing and administrations announced in 2018 feeding through across GB. Table 3. Openings and closures of multiple retailers by region across the top 500 GB town centres in 2018 (Source: Local Data Company). Greater London saw the largest number of net closures across all the regions, with fashion retailers closing the most in the capital (-79 units). Scotland was the only region to see a drop in its net closures, dropping from -148 in 2017 to -119 in 2018. Wales was the best performing region, posting the lowest overall net decrease in chains of - 59. For all press enquiries please contact david.jetuah@pwc.com.